Cari Quinn, Girl Writer: Indulgent Blog Hop! Looking for the 18 and Over Blog Hop? Scroll down! 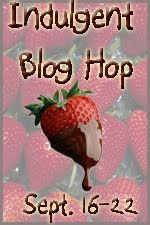 Welcome to the Indulgent Blog Hop! Click on the graphic above to return to the site. I'm so happy to be part of this hop and to share one of my favorite indulgences with all of you. It's not particularly expensive, but it's a decadent treat I look forward to each year. What is this yumminess? I know, I know...not very exciting, right? But I love them. The nutmeg, the layers of whipped cream, the aromatic pumpkin flavor...all combine to be a sense explosion that makes my taste buds tingle. I wait for them all year! TWO winners will win the ebook of their choice from my backlist! If you could experience any indulgence in the world - and price was no object - what would it be? And yes, I know this is beyond hard...just pick whichever book works for you today! If money was no object, I would travel and see the world. if money was no object i think the only thing i would really want is to go to the moon. thanks for joinging in on the hop!!! I would love to travel and attempt to go to every country in the world for at least a day. Money is no object: I would buy my dream home with a two story library and one of those fancy spiral stair cases to the second floor and fill it with tons and tons of books! Thanks for the awesome giveaway!! Sit in a hot tub at a mountain lodge, Book in hand, nature all around. Soaking up the peace. If money was no object then I would take a cruise every year. Or build me a house in the country with a sleeping porch where I could relax with a good book (or more). Thanks for the giveaway! I'm a very simple person. The priceless indulgence would be to build a library in my home. It'd had a reading nook, a rolly ladder, and I'd have hardback copies of all my favorite books. Traveling around the world would be wonderful. Thanks for the giveaway! I would love to travel to europe and visit all the different castles! My first love was historical romance books and that dream has stuck with me even though I no longer read many historical romances. I think I'd travel all over the world sampling all the spa/massage techniques used (I LOVE massages)! If money was no problem I would love to spend a week at a resort in the Bahamas with my hubby. Need Me looks wonderful. Thanks for the giveaway. I would build my dream home with my dream library! Thanks so much! Quit my dayjob, hire a personal chef and a personal trainer. The ultimate indulgence for me is coffee and a good book, so if price were no object it would have to be the location of drinking and reading LOL Perhaps a Greek cafe in the shade would do quite nicely ;) Thank you for the fun. Money no object? Unlimited travel and chocolate. I would travel and see the world. Thanks for the chance to win! I would return to Kauai for a while with hubby, which is where we went for our honeymoon! If money was no objest I would take a trip to Italy.. If money were no object...I would travel the world and see everything! My dream would be to build a log cabin next to a large lake surrounded by trees. I could sit out on my deck and drink my coffee while watching the animals out in the forest. I would visit all my must see places. Greece, Rome, Scotland, Ireland, just everywhere I could think of (and take all the people I wanted with me). If money was no object, I would love to travel and see as much of the world as possible, spending time exploring other cultures and histories. I would also indulge in travel. I would probably spend time at a small chateau in France or a villa in Italy and read, read, read. Not going to work would be an indulgence. I would build a beautiful and comfortable home with an amazing view of the ocean and the local mountains. This is such a fun hop. Thank you for the chance to read one of your stories, Cari. I have read that bathing in the spermeaceti of the sperm whale is extremely indulgent. Of course, i don't particular want a whale to die for me to indulge in this, but this is just fantasy, right? If money wasnt an object, my one indulgent whim would be to travel the world. I want to see it all! And of course shop. Id want to take pieces of that corner of the world back home with me. :) Thank you for the awesome hop and giveaway!! I would take my whole family for a six month vacation through Europe staying at all the five star hotels. I'd travel around the world. thank you for the chance at such a great giveaway. i think if i could have anything i wanted and price didn't matter i would have a translator teach me ancient greek,hebrew and arabic and then read me the Bible in the original texts. i have always wondered how different it was once it was translated. if i had a choice of just 1 of your books i think it would be "Unwrapped". i mean let's face it that cover is smokin and the excerpts i have read are HOT! LOL!